Just a Tanya Anor rough sketch but already pretty fantastic, eh? Beyond graphics design issues, T.R. Knight (who recently worked on Fantasy Flight Games’ Genesys Core Rulebook) and one of his colleagues, Marshall Oppel, have been busy in the meantime with editing the game text. If experiences so far are any indication, it should be a fairly smooth ride. So what`s the road ahead? 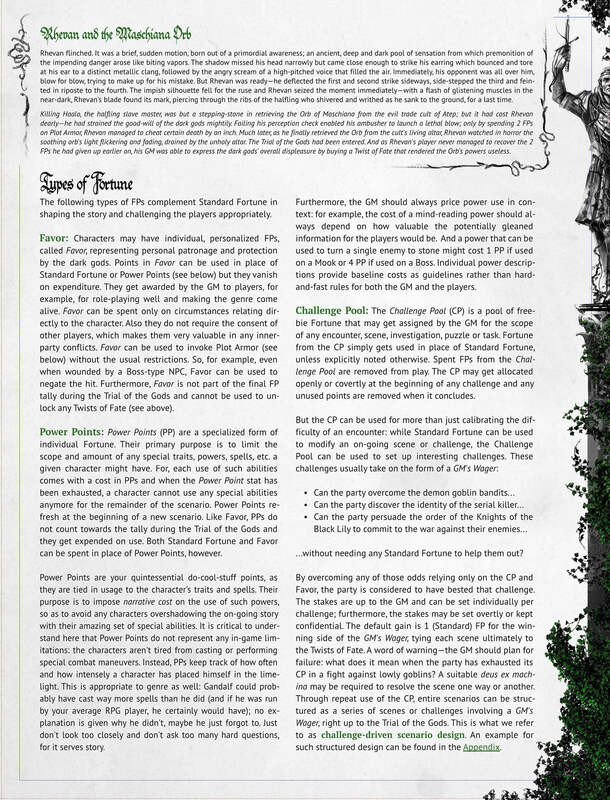 As many of you may be aware of, we originally planned to release an excerpt chapter about Fortune Point rules first (the above screenshot is from that chapter, of course) as promotional material. There has been a minor change of plans, however, because, after plenty of soul-searching, we have come to the conlusion that it is not a good idea for a virtually unknown project to release RAW sample material. So, releasing an excerpt chapter with exciting new rules might be all good and fine but if it’s not visually pleasing as well, it might send you the wrong message about the seriousness of our efforts! Until then, we’re thinking about new ways to introduce the game and its sophisticated ruleset to the role-playing audience – such as a public demonstration of the game’s combat rules. And, of course, we’re listening to your suggestions for what you want to see out of this just as well! In conclusion, we’re very excited about the game’s progress and are very much looking forward to bringing this game finally to you. Please stay tuned for more updates and for more ground-breaking material to follow soon! So grab your dice and grab your sword… for the dark gods await.